The main street leading from the Church of Nativity, Bethlehem, 1880. Bethlehem (Arabic: بيت لحم‎ Bayt Laḥm (help•info) "House of Meat" Bēt Laḥm,lit. "House of Bread"; Hebrew: בֵּית לֶחֶם Bēṯ Leḥem, Modern: Bet Leḥem [bet ˈleχem], lit. "House of Bread"; Ancient Greek: Βηθλεέμ [bɛːtʰle.ém]) is a Palestinian city located in the central West Bank, about 10 kilometers south of Jerusalem. It is thought the original name was Beit Lachama, from the Canaanite god Lachama. The earliest mention of the city is in the Amarna correspondence, 1350-1330 BCE, as "Bit-Lahmi". The Hebrew Bible identifies it as the city David was from and where he was crowned as the king of Israel. The New Testament identifies Bethlehem as the birthplace of Jesus. The city is inhabited by one of the oldest Christian communities in the world. Grotto (Jesus birthplace in the center, Manger at the right - In Bethlehem the cave is pointed out where He was born, and the manger in the cave where He was wrapped in swaddling clothes. And the rumor is in those places, and among foreigners of the Faith, that indeed Jesus was born in this cave who is worshipped and reverenced by the Christians. Saying, Where is he that is born King of the Jews? for we have seen his star in the east, and are come to worship him. - Bible. Adoration of the Magi The Star of Bethlehem is shown as a comet above the child. Giotto witnessed an appearance of Halley's Comet in 1301. - The Star of Bethlehem was a star of hope that led the wise men to the fulfillment of their expectations, the success of their expedition. Nothing in this world is more fundamental for success in life than hope, and this star pointed to our only source for true hope. - Jesus Christ. Are you willing to believe that love is the strongest thing in the world - stronger than hate, stronger than evil, stronger than death - and that the blessed life which began in Bethlehem nineteen hundred years ago is the image and brightness of the eternal love? - Henry Van Dyke. In Bethlehem the cave is pointed out where He was born, and the manger in the cave where He was wrapped in swaddling clothes. And the rumor is in those places, and among foreigners of the Faith, that indeed Jesus was born in this cave who is worshipped and reverenced by the Christians. Origen of Alexandria in: Pilgrimage in the Holy Land: Israel, AuthorHouse, 2013, p. 335. Bible in:The New Testament of Our Lord and Saviour Jesus Christ, The University Press, 1882, p. 120. Bible in: The New Testament of Our Lord and Savior Jesus Christ, Porter & Coates, 1881, p. 25. Bible in: Hendrickson Bibles Complete Evangelical Parallel Bible-PR-KJV/NKJV/NIV/NLT, Hendrickson Publishers, 1 February 2013, p. 542. Bible in: Frederic Charles Cook The Holy Bible, According to the Authorized Version (A.D. 1611): Romans-Philemon, John Murray, 1873, p. 188. Bible in: The Holy Bible, in the Authorized Version, Volume 2, Rivingtons, 1878, p. 47. Bible in: William E. Manley Biblical Review, A. Tompkins, 1874, p. 311. Bible in: Reverend Terrance J. Shaw The Shaw's Revised King James Holy Bible, Trafford Publishing, 18-Aug-2010, p. 153. Bible in: The New Testament of Our Lord and Saviour Jesus Christ, The University Press, 1882, p. 452. 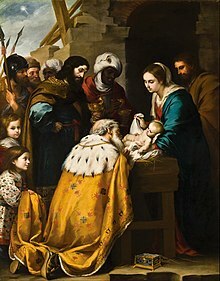 Matthew 2:16 - Then Herod, when he saw that he was mocked of the wise men, was exceeding wroth, and sent forth, and slew all the children that were in Bethlehem, and in all the coasts thereof, from two years old and under, according to the time which he had diligently enquired of the wise men. Bible in: Bible verses related to Bethlehem from the King James Version, King James Bible Online. Micah 5:2 - But thou, Bethlehem Ephratah, [though] thou be little among the thousands of Judah, [yet] out of thee shall he come forth unto me [that is] to be ruler in Israel; whose goings forth [have been] from of old, from everlasting. Bible in Bible verses related to Bethlehem from the King James Version, King James Bible Online. And Rachel [Jacob’s wife] died, and was buried in the way to Ephrath, which is Bethlehem. Bible in: Willibald Sauerlander The Catholic Rubens: Saints and Martyrs, Getty Publications, 15 April 2014, p. 258. Ambrose Bierce in: The Devil's Dictionary: Easyread Large Bold Edition, ReadHowYouWant.com, 13-Feb-2009, p. 184. Phillip Brooks in: Martin Connell Eternity Today, Vol. 1: On the Liturgical Year: On God and Time, Advent, Christmas, Epiphany, Candlemas, A&C Black, 01-Nov-2006, p. 137. Sydney Carter in: Living the Eucharist: Celebrating Its Rhythm in Our Lives, Twenty-Third Publications, 2005, p. 7. The Star of Bethlehem was a star of hope that led the wise men to the fulfillment of their expectations, the success of their expedition. Nothing in this world is more fundamental for success in life than hope, and this star pointed to our only source for true hope. Jesus Christ quoted by James Kennedy in Christmas Stories for the Heart in: Reed Markham The Book of Christmas Hope, Lulu.com, p. 91. Are you willing to believe that love is the strongest thing in the world - stronger than hate, stronger than evil, stronger than death - and that the blessed life which began in Bethlehem nineteen hundred years ago is the image and brightness of the eternal love? Henry Van Dyke in: William Powell Tuck Christmas Is for the Young... Whatever Their Age: 16 Christmas Sermon Stories, CSS Publishing, 1 January 2007, p. 105. Rev Richard J Fairchild in: Daniel A. Armah Lessons of Christmas, Xulon Press, 2011, p. 217. Lucinda Franks in: Reed Markham The Book of Christmas Hope, Lulu.com, p. 63. The stars which shone over Babylon and the stable in Bethlehem still shine as brightly over the Empire State Building and your front yard today. They perform their cycles with the same mathematical precision, and they will continue to affect each thing on earth, on cluding man, as long as the earth exists. One response was given by the innkeeper when Mary and Joseph wanted to find a room where the Child could be born. The innkeeper was not hostile; he was not opposed to them, but his inn was crowded; his hands were full; his mind was preoccupied. This§ is the answer that millions are giving today. Like a Bethlehem innkeeper, they cannot find room for Christ. All the accommodations in their hearts are already taken up by other crowding interests. Their response is not atheism. It is not defiance. It is preoccupation and the feeling of being able to get on reasonably well without Christianity. Billy Graham in: Tricia Goyer Generation NeXt Parenting: A Savvy Parent's Guide to Getting it Right, Doubleday Religious Publishing Group, 23 June 2010, p. 313. Take time to be aware that in the very midst of our busy preparations for the celebration of Christ's birth in ancient Bethlehem, Christ is reborn in the Bethlehem's of our homes and daily lives. Take time, slow down, be still, be awake to the Divine Mystery that looks so common and so ordinary yet is wondrously present. Edward Hays quoted in: Rev. Bob FillierMinistry Message , St. Thomas United Church. So death lay in arrest. But at Bethlehem the bless'd Nothing greater could be heard Than a dry wind in the thorn, the cry of the One new-born, And cattle in stall as they stirred. C.S. Lewis in: Clive Staples Lewis, Chad WalshThe Visionary Christian: 131 Readings from C.S. Lewis, Macmillan, 1981, p. 188. The Magi and the Star of Bethlehem. Guide us to thy perfect light. - John Henry Hopkins, Jr..
John Henry Hopkins, Jr. quoted in Probe Ministries in: The Star of Bethlehem, Bible Organization, and also in A Book of Feasts and Seasons, Gracewing Publishing, 1992, p. 65. From the Christmas carol, "We Three Kings of Orient Are," introducing to what seems to be the only ubiquitous biblical symbol during the Christmas season, the star of Bethlehem. There were only a few shepherds at the first Bethlehem. The ox and the donkey understood more of the first Christmas than the high priests in Jerusalem. And it is the same today. Thomas Merton quoted in: Lance Colkmire Evangelical Sunday School Lesson Commentary 2013-2014, Pathway Press, 5 January 2012, p. 164. The triple conjunction of Jupiter and Saturn in 7 B.C. was seen in the constellation Pisces in the months of May, September, and December. This provides sufficient time for the magi to see the first conjunction, begin their trip west to Judea, visit Herod by the second conjunction or at least soon afterwards, and perhaps not reach Bethlehem until the third conjunction when it is said to have appeared in the southern sky, and Bethlehem is just south of Jerusalem. Remember how the magi rejoiced to see the star again as they departed Jerusalem for Bethlehem. Probe Ministries in: [https://bible.org/article/star-bethlehem The Star of Bethlehem], Bible Organization. George W. Truett in: George Sweeting Who Said That? : More than 2,500 Usable Quotes and Illustrations, Moody Publishers, 1 September 1995, p. 101. Bethlehem lies 10 kilometres south of the city of Jerusalem, in the fertile limestone hill country of the Holy Land. Since at least the 2nd century AD people have believed that the place where the Church of the Nativity, Bethlehem, now stands is where Jesus was born. One particular cave, over which the first Church was built, is traditionally believed to be the Birthplace itself. 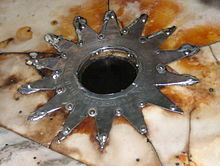 In locating the Nativity, the place both marks the beginnings of Christianity and is one of the holiest spots in Christendom. John Wade (1744) quoted in: Kenneth W. Osbeck Amazing Grace: 366 Inspiring Hymn Stories for Daily Devotions, Kregel Publications, 01-May-2002, p. 352. ...This Advent, let's go to Bethlehem and find our kneeling places. - Ann Weems. This Advent let's go to Bethlehem. In the midst of shopping sprees. let's ponder in our hearts the Gift of Gifts. Through the tinsel let's look for the gold of the Christmas Star. This Advent, let's go to Bethlehem and find our kneeling places. Ann Weems in: Kneeling in Bethlehem, p. 19. Charles Wesley quoted in: Seventh-day Advenist Hymnal Word Edition, Review and Herald Pub Assoc, p. 30. 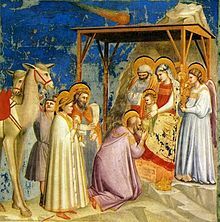 After Jesus was born in Bethlehem in Judea, during the time of King Herod, w:MagiMagi from the east came to Jerusalem and asked, “Where is the one who has been born king of the Jews? We saw his star when it rose and have come to worship him. Then Herod called the Magi secretly and found out from them the exact time the star had appeared. He sent them to Bethlehem and said, “Go and search carefully for the child. As soon as you find him, report to me, so that I too may go and worship him. This page was last edited on 28 August 2016, at 13:57.